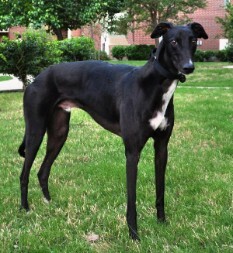 History: Wray was not competitive enough to race at Gulf Greyhound Park (no races to his credit) so he was moved back to the farm to wait to be moved into an adoption program. Although a little timid at first, he is warming to his new foster home. He takes comfort in being with the other dogs in the home. 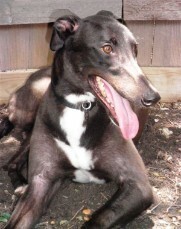 Greyhound housemate, Shawnee will show Wray about house living and will be an excellent teacher. So far, Wray has been an excellent student as well. After Wray settles into his new environment, his progress will be updated. Wray with his brother, Wiki - becoming best buds! 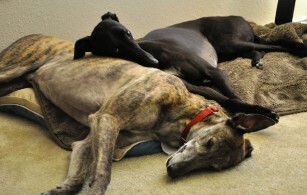 Wray found his forever home with Greyhound buddy, Wiki, and his people, April and Richard. November 4, 2011 update: Wray went to the Rainbow Bridge. He is greatly missed by his family. 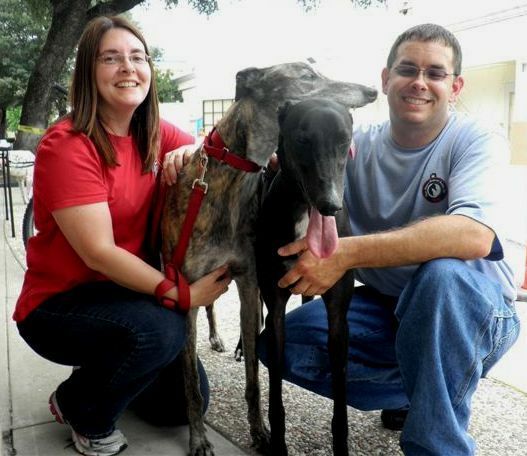 April 30, 2011 update: Adopted! This is the transformation of Wray, also known as the joys and rewards of being a foster. When Wray came to us he was a very insecure, shy, uncertain boy. Still he was sweet and wanting to be loved. He did not know what the good life of being a greyhound could be. He had so much to learn but was very cautious of what might happen to him. He did not know that a treat was good and to be expected. Finally, the day came when he took a treat from my hand. Can you imagine my joy? Each day Wray learned slowly who he was and what it meant to be in a home with loving humans. During his first weeks he spent his time either on his dog bed in the house or outside. A walk on a leash was his comfort zone. When it is time for a walk he goes to where the leashes are hanging and waits patiently, while the other two are going wild. Wray did not know how to get into a SUV or even a car without help. You need to see him jump into the back of a SUV now – it’s a beautiful sight! Initially he reminded me of the cowardly lion from THE WIZARD OF OZ. 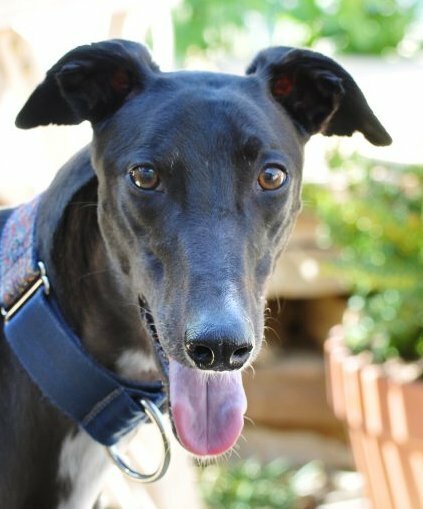 He would follow the other two greyhounds and learned enough and gained enough confidence that finally one day he was no longer the follower but the first one out the door. When we say it is time to go to bed, he trots to his crate, turns around and waits for that treat from my hand (smart boy), lies down, and sleeps all night. He is not crated during the day while we are gone. One of Wray’s most endearing habits is that while standing next to any greyhound he will rest his head on the other greyhound’s back or on my leg while I am at my desk. Sometimes you would think he is asleep on his feet. He will now seek out his humans and stay with us. He is even so sure of himself that sometimes he is on his bed in a room by himself. Still, he has never tried to get on furniture or get anything from the counters. His personality is gentle, sweet and loving. He is so happy that when he is asleep he wags his tail. He is a gentle happy boy. There is no place like a forever home for this special dog. Could it be yours? Although Wray has been with TAGS since mid-June, he has taken his time to transition from farm life to home life. He was in one foster home for a while and has now been moved to another. 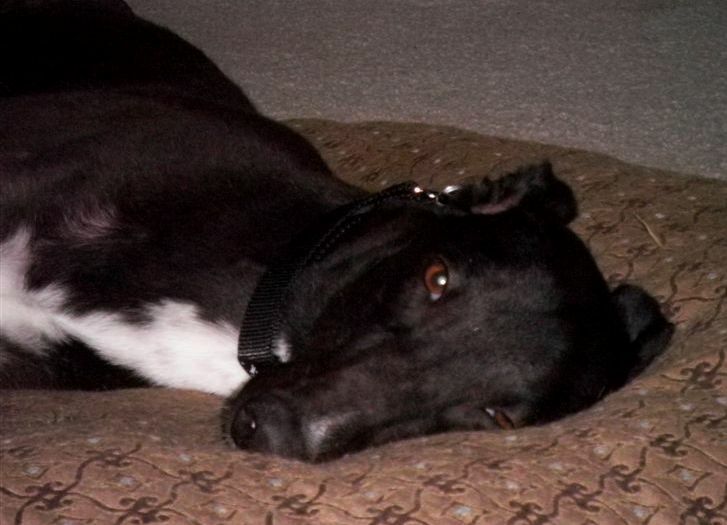 He has only been in our home (with two other Greyhounds) for approximately two weeks. He seems to improve with each move and with time. We have seen huge strides in his trusting us and gaining confidence. He eats in the kitchen with the others. We still watch from close by to make sure Vixen does not try to eat his food. He still prefers that we not be in the kitchen while he eats. He even came into the kitchen while we were eating one evening, which he had never done before. Wray checked out what he could see on the counter and left when I told him “no.” That evening he came into our bathroom and closet while we were there. Again, he had never shown such bravery. He has discovered all the toys and played with each one, showing off for us and piling them all on his bed. He is always the first to greet us at the door when we come home with the tail going in more directions than I knew were possible. He does sometimes follow us and will come up to us, usually if we are sitting. This is also a vast improvement. His walks have been a great success. On his walks, Wray has met strangers of all ages and is perfect. Other dogs do not bother him at all. The rabbit thing is almost nonexistent. He only looks at the rabbits now, instead of going in circles, jumping and trying to get them. We are continuing to love him and praise him when called for. Never more than a “no” has ever been spoken. You cannot believe how excited he gets for his very shot walks. I cool him down before and after with a cold wash rag, and always when it is less hot. Wray has NEVER tried to get on furniture, beds, etc. Although shy, he is also very sweet with the most beautiful face and soulful eyes. What’s not to love!! As with all new fosters, his transition is not and will not be perfect. We will work through issues as they arise. We know he will test us as he gains confidence. He started with so little it is heart warming to watch him learn to trust people.